This Dutch Colonial residence was designed by architect Norman Foote Marsh and built in 1904 as one of the earliest homes in the area then known as Colgrove. The property had originally been subdivided in 1880 by former United State Senator Cornelius Cole (1822-1924). Cole, who served in Congress from 1863-1865 and the Senate from 1867-1873, was an anti-slavery confidant of President Abraham Lincoln and helped keep California in the Union. After retiring to Los Angeles, he practiced law and dealt in real estate, living to the age of 102. He deeded the land to Paul A. Holman in 1897, who subsequently built the two-story house seven years later. The property was sold to William E. Belkamp in 1913, who is believed to first have named the house “Orchard Gables.” From 1949 until 1951 it housed the Orchard Gables Repertory Theatre Company. 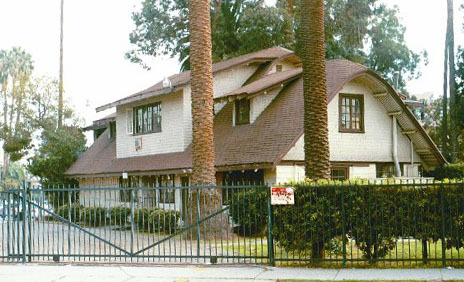 Beginning in the early 1950s the property served as a hospital and later a retirement home, also called “Orchard Gables.” Two small buildings were added, one in 1952 designed by Paul R. Williams and the other in 1955, designed by Robert Stacy Judd. Only the original house, however, has been designated as a monument.